Venetian Blinds for windows have always been a common furnishing in homes all around the world. They are great as they have an easy time blending in with most home styles, while offering control over the two major elements that blinds are designed to manage–light and privacy. Another great benefit that venetian blinds bring to the table is that they don’t require a lot of maintenance. Most of the time, cleaning requires nothing more than the light brush of a vacuum. 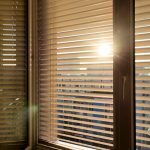 If you are interested in acquiring venetian blinds for your home or office, you might be wondering where to source them from. Before making the purchase, it pays to understand a bit more about this window furnishing, and the finishes it is available in. Available in an array of colours, materials, and slat widths, venetian blinds are ideal for the lounge, bedroom, and kitchen. The first finish that venetians come in is timber. Timber venetians add warmth and style to any home in which they are installed, whether modern, heritage, or period. The next finish is aluminium. Aluminium venetian blinds give off a sleek, modern, and stylish look in any space they are installed. They are perfect for homes of all kinds, especially those that are contemporary. Finally, the last finish commonly available is PVC. PVC venetians are a fantastic cost effective alternative to timber. They are available in all the same specifications, just in a different material. They are great for any area of the home, but particularly wet areas, such as bathrooms, laundries, and kitchens. If you are after more information on venetian blinds, feel free to call an expert from our team on 03 9544 4999. With over 60 years experience in the industry, we love tailoring the best solutions for our customers.